Visit the Napa Wineries: a local's guide. Visiting the wine country is a great side trip to do when you're in San Francisco. It's beautiful and the wineries are so much fun to visit. Which are the best Napa wineries to visit for wine tasting? There are over 400 hundred wineries scattered up and down the Napa Valley. So which ones to choose? To make it a bit easier, I've listed some suggestions...a small sampling of Napa Valley wineries that I personally think are worth a visit. Trying to see too many in one day detracts from the relaxing nature of the experience; three or four is about right. Leisurely sipping and peaceful enjoyment is the ticket! My parents lived in Napa for over 20 years, so I've made countless trips from San Francisco to the Napa Valley, and explored it top to bottom. Napa's been like my second home for a long time, so I'm practically a local. Take a Wine-tasting Tour or Do It Yourself? There are pros and cons to each approach. Everyone can do the wine-tasting. A biggie! No worries about drinking and driving, or missing out on one of the most fun aspects of visiting the Napa Valley. No stress about navigating to the wineries. No stress about hitting traffic coming back from Napa. Very important! Late afternoon traffic coming back to the city can be ugly. No additional expenses like renting a car and paying the bridge toll. Wine tastings are included on some tours. Tastings generally start at $15 and go up. Interesting information about Napa wine production and the wineries from the guide. You're on a schedule, no wondering off to explore. You go at your own pace; spend two hours hanging out at a winery if you want. You choose the wineries. Is there a particular type of wine you're interested in? Have you heard about a particular winery you want to visit? 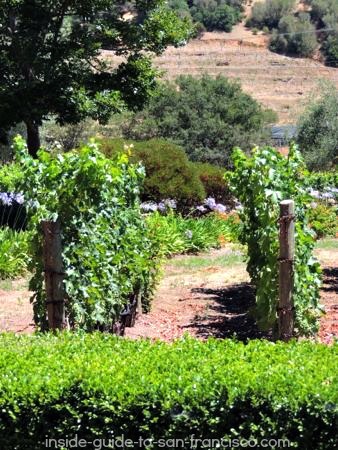 Time to explore some of the wine country towns: Calistoga, St. Helena, Yountville. Expensive to rent a car. Stressful driving in Bay Area traffic. Need a non-drinking driver. Someone gets left out of tasting. You have to educate yourself on winemaking. etc. The guide who takes you there usually fills you in on a lot. You have to pay for all the tastings and tours, gas and bridge tolls. It can add up. 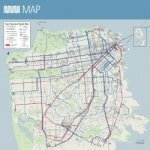 If you're here without a car, I recommend doing a tour. 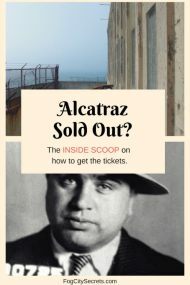 By the time you rent the car, pay for any insurance, pay the Golden Gate Bridge toll ($7.75), pay for gas, and pay for the wine tastings and tours at three or four wineries, it's probably a lot cheaper and easier to do the tour. On a tour you can sit back and admire the scenery, and taste as much as you want. Traffic jam on the freeway on the way back to the city? No problem, just sit back and enjoy the view! Half-Day Wine Country Tour. Pressed for time? 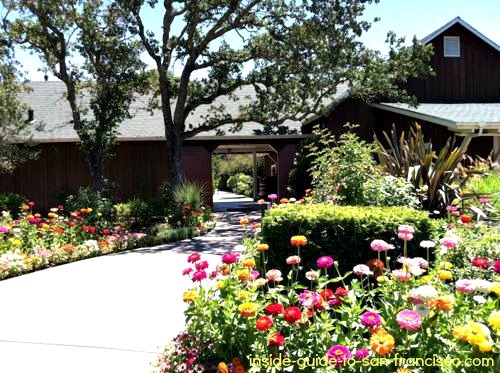 Visit two out-of-the-way Sonoma County wineries, with hotel pick-up. Small group, five hours. $85 (one winery's tastings included). $5 off if booked online. See Half-day Tour for more info and booking. Napa and Sonoma Wine Country Tour. 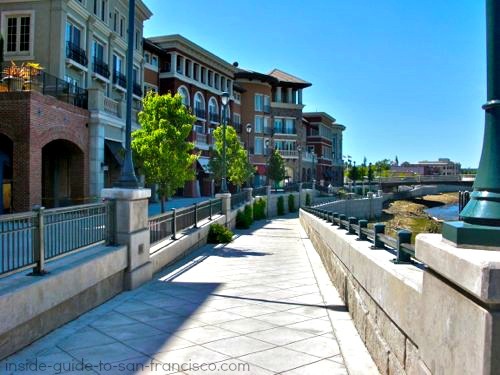 Visit 3 wineries in Napa and Sonoma, and have lunch (on your own) in the cute Napa Valley town of Yountville. $91 (all tastings included- good deal). 8 hours. See 3 Winery Tour for more info and booking. Napa Valley Wine Country Tour. This 8.5-hour tour includes a lot of goodies: visit 4 wineries, in both Sonoma and Napa Valley, enjoy a breakfast on the bus with mimosas, a picnic lunch at a winery, and with an olive oil tasting thrown in. $129 (tastings extra). For more info and booking, see 4 Winery Tour. Napa Wine Tasting Tour. 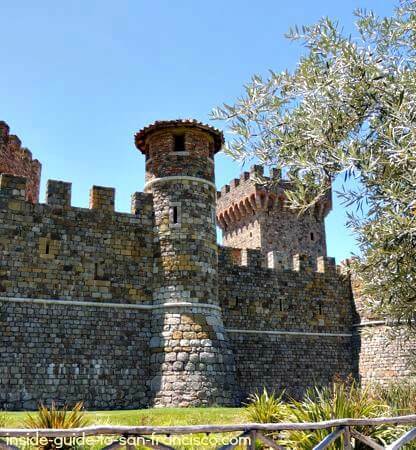 This 9-hour tour visits four wineries in the Napa Valley, including the really cool castle winery, Castello di Amorosa. It's a small group tour, with lunch, hotel pick-up included. $105 (tastings and winery tours extra). For more info and booking, see Small Group Napa Tour. Note: most tastings run around $15 to $25, and often include 5 or 6 wines. Long gone are the days of free tastings, alas. Guided tours of the winery are more. Inclusive tours save money, but offer less flexibility. Personal preference. Wine, Redwoods and Sausalito. 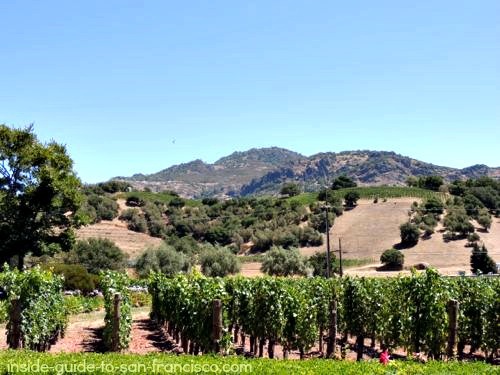 If you want to visit two Sonoma wineries, explore Muir Woods and browse the seaside town of Sausalito, there's a tour that takes you there, too. Plus a ferry ride back to San Francisco, considered one of the prettiest ferry rides in the world. Includes hotel pick up, and one of the wine tastings, and a tour guide. 9 hours, and you can hang out longer in Sausalito if you want (try Scoma's seafood restaurant on the waterfront - yum). $129.00 ($4 off if booked online). 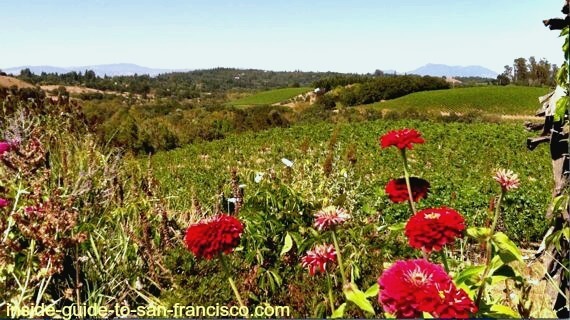 For info and booking, see Wine Country, Muir Woods and Sausalito Tour. Travel back to 1915 on the elegant wine train, enjoying a multi-course, gourmet meal while the beautiful Napa Valley vineyards glide by the windows. I went on this years ago and it was great fun! The vintage cars are decorated like the European trains of the early 1900's: a nostalgic experience of the life of the leisure classes in years gone by. Tip: the wine train is available for either lunch or dinner. During the summer when the days are long, either one is a great experience. However, during the winter months, I recommend doing the lunch trip, because after dark you can't see any of the gorgeous scenery. I was in Napa recently when the Wine Train was pulling into the Napa train station. 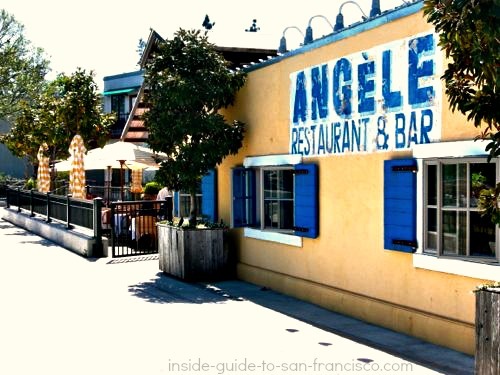 If you are going to be in Napa, or have transportation to Napa (an hour and a half drive from San Francisco), you can book either the lunch trip or the dinner trip. The lunch trip has a 10:30 am check in at the Napa train station, and the dinner trip checks in at 5:30 pm. The train journey itself is 3 hours, plenty of time for a leisurely meal in your very own Orient Espress. More more info and booking, see Napa Wine Train. 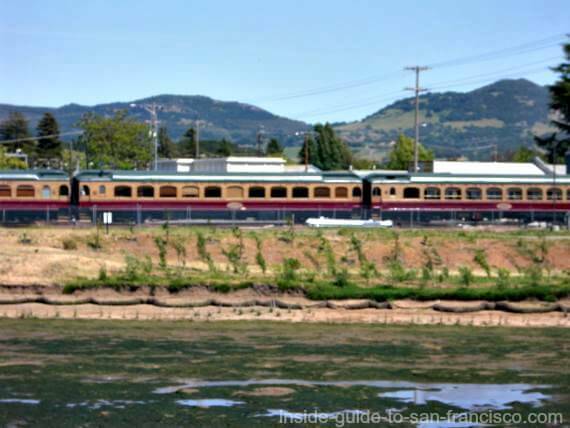 To book a trip on the wine train, with transportation from San Francisco, click here. Or combine the wine train with a tour of one or two wineries. To check out the tour, click here. I like to do some research on interesting wineries before I set out, and check for wine tasting coupons. If you can, it's much more enjoyable to go during the week and avoid the weekend crowds and traffic. Tips for saving money on wine tasting. Get coupons for free wine tasting! Often hotels and B&B's will have coupons given them by certain wineries for free or discounted wine tasting. Be sure to ask if you're you're staying in a hotel. Also, sometimes wineries will have coupons on their websites for free or discounted tastings. Requires some research, but could be worth it. You can sometimes get a free tasting if you buy a bottle of their wine. Ask. My suggestions for a do-it-yourself wine tour. Here's a trio to try out: a famous winery, a pretty winery and an unusual winery. 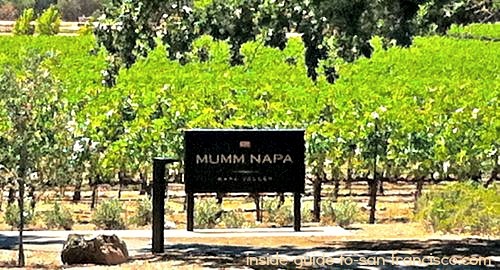 Mumm Napa is the place to stop if you like champagne and other sparkling varieties. The buildings are unpretentious and placed in a low-key, garden-like setting. You can do the tasting in a choice of settings: a glassed-in patio, an open air patio or a terrace area, all overlooking the pretty grounds and vineyards. Mumm Napa was named one of America's best tasting rooms by Wine Enthusiast. They also have a nice art gallery with Ansel Adams photographs. Tours: 45 minute tour of the vineyard, winery and browse their Ansel Adams collection and other photos in their art gallery. Tours at 10 am, 11 am, 1 pm and 3 pm include wine tasting: $40, must over 21. Hours: Daily 10 to 6, last tasting 5:45. Location: 8445 Silverado Trail, Rutherford (20 min north of Napa). Very crowded on weekends; get there early. Better on weekdays. Mumm's Napa website, (866) 783-5826 (reservations), (800) 686-6272. The Pine Ridge Winery has one of the loveliest settings I've seen, tucked up against a steep hillside covered with grape vines. They've also created a demonstration vineyard for guests to explore just outside the building. Tasting: choices of five wines: $40 for a selection of current Pine Ridge wines. Tours: extensive tours of the vineyard, wine production, and caves, followed by a tasting. 10, 12 and 2. Reservations required, ages 21 and up only. $50 per person, max of 8 people. Location: 5901 Silverado Trail, just north of Napa. The San Francisco Chronicle named Pine Ridge Winery as one of the "Best of the Best Tasting Rooms in Napa". This one is great fun: a full-scale medieval castle has been created in a gorgeous Napa Valley setting. The owner has a passion for medieval architecture, so along with tasting some excellent wines, you get to explore a huge, authentic Tuscan castle! Truly amazing (and odd). 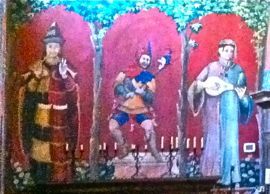 Scene from the frescos decorating the walls of the Great Hall, Castello di Amorosa. See more info and photos on the weird and amazing Castle of Love winery. Tasting and entry: $25 (ages 8-20, $15). Includes 5 wines and entry to the castle. Hours: Daily, 9:30 to 6 (9:30 to 5, Nov-Feb). Location: 4045 North St. Helena Way (Highway 29), Calistoga. Castello di Amorosa website, 707 967-6272. 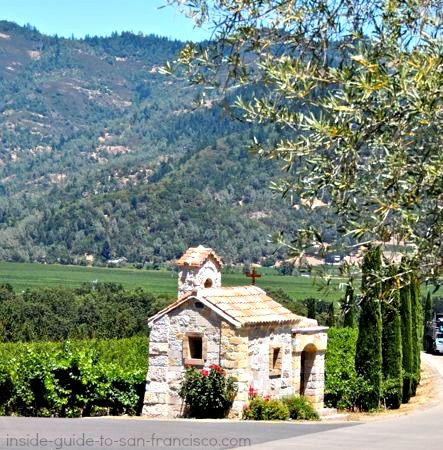 Wine Country Tour that includes the Castello di Amorosa. If you want to explore this cool winery and two others, there's a highly-rated tour from San Francisco that takes you up to three Napa Valley wineries for tastings. This is a small group tour, limited to 12 people, accompanied by a guide to fill you in on winemaking in Napa. About 9 hours. $105. See Wine Country Tour for more info and booking. Two parallel highways travel up the length of the Napa Valley: Highway 29 and The Silverado Trail. Tip: the Silverado Trail runs close to the mountains on the east side of the valley; it's prettier and less crowded. Napa itself is not an especially attractive town, compared to a charmer like Sonoma, but it is a pleasant spot for a stopover. 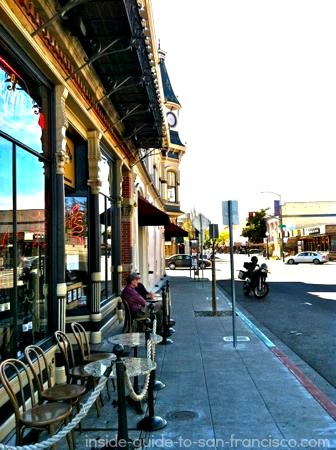 A few years ago, the city decided to spiff up the downtown, which was a typical, pokey Northern California small town, with a court house on the main square and a few blocks of Victorian houses. They built a series of buildings along the Napa River (a small and unremarkable river) that are new-looking but surprisingly attractive. In addition to condos and offices, a handful of excellent restaurants have been tucked in there, making it an enjoyable place to stop for lunch or dinner. Angele. Gourmet French cuisine. Delicious food, pretty patio setting on the river. Somewhat pricy, but worth it. 540 Main St.
Celadon. Hard to classify; Asian, Mediterranean, Latin American selections. Yummy. In the Napa Mill, 500 Main Street. The Pearl. Pork chops, polenta, oysters, tacos, etc. Moderately priced, small, cute. 1339 Pearl St.
Cole's Chop House. In the mood for meat? This is the place. Try the onion hash. Great desserts, too. 1122 Main St.
Grace's Table. Wide geographical variety. Friendly and tasty. 1400 2nd St.